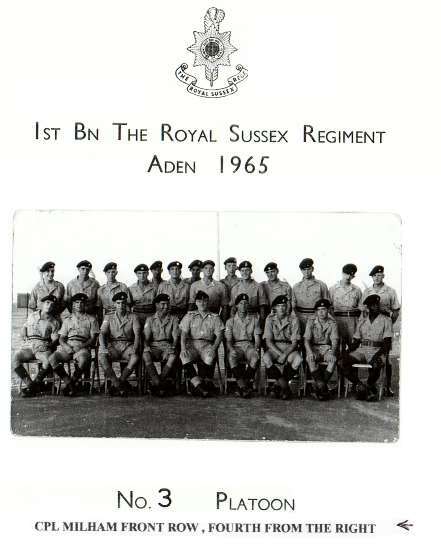 I became involved in the British Army's operations in Aden as a member of the Territorial Army; I was not a regular soldier. I had originally joined the services as a boy seaman in the Royal Navy, aged 15, in 1951. I went to sea on various ships as a Navigator's Yeoman, and during my service, became involved in operations in British Guiana, Cyprus and at Suez. So you can see, I was not a new boy when it came to being in the wrong place at the wrong time. On leaving the Navy in 1959, (I was nearly always seasick), I found it very difficult to settle in civilian life, it really was boring. But I was married and had 2 young children, so had to put up with it. However, my brother-in-law suggested that I should consider joining my local Territorial Army. I went along to have a look and was soon involved several nights a week and some weekends; it was my lifeboat and kept me in civvy street. Very soon the offer came up to join a special reserve called 'The Ever Readies', a force that could be called up for service at very short notice. One attraction was that it paid a bounty at the end of the year of 150 GBP; my annual wage at that time was just over 450 GBP, so I joined. In 1964 a new Labour government replaced the Conservatives and almost immediately the political and military situation in Aden deteriorated. Terrorists got bolder and British troops, families and police became higher profile targets. 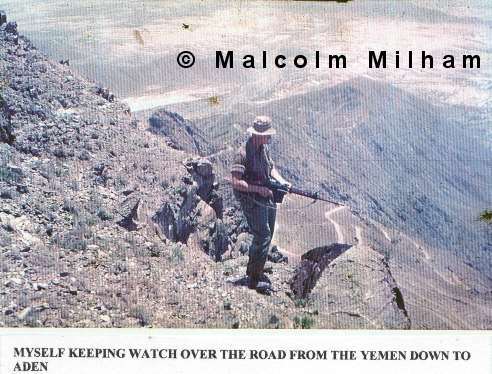 The highest profiled incident was at the end of April 1964, when a patrol of the SAS got into difficulties and two of them ended up being beheaded, somewhere in the Radfan Mountains northeast of the port of Aden. Reports of this highlighted what was going on in that area. Just over a year later, on the Thursday evening before Good Friday 1965, I arrived home only for my wife to declare that she believed I had been called up for duty. On asking why she thought this, she told me that she had seen a report on TV news, regarding 120 'Ever Readies' being called up for service in Aden. I pointed out that there were six thousand of us, hence the odds against were pretty good. The odds shortened when the local TV news broadcast said that they were from our area. Very early the next morning there was a loud knock on the door and a smiling postman handed me a large brown envelope, I was to report for duty in four weeks time. Early in May I reported to the Depot at Canterbury, drew my kit, received some training and caught a flight to Aden. 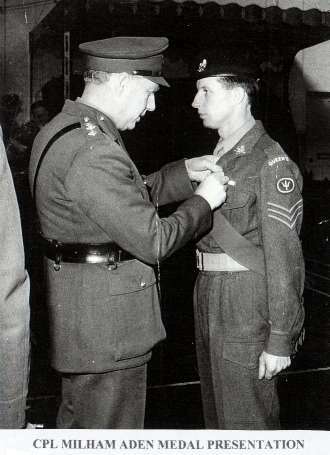 I was now a corporal in 1st Battalion The Royal Sussex Regiment, in charge of a section of ten men. On arrival the first person I saw was my cousin, a regular soldier in the Battalion who was the 2IC's driver. We arrived at our camp, a collection of large tents surrounded by barbed wire and out on the bare desert. I was posted to 3 Platoon in 'A' Company. My officer was also TA, just called up and my sergeant was a regular soldier. The next week or so was taken up with more intense training and acclimatization, but at least we got each night in bed. I then started leading patrols out on Internal Security (IS) duties and the long hours of work began. After only a week on IS patrols news came through that 'A' Company was moving up country into the Radfan Mountains to work with the Royal Marines. We stopped IS patrols and the new training now took on a very serious meaning. Even more so when we heard our platoon were going to a place codename 'Piccadilly', as we heard it mentioned on the news broadcasts several times, and it seemed they were always in the thick of the action. Our move up into the Radfan was by 4-ton trucks, with armour plating under the driver, no doors or windscreens and the floor covered in sandbags. Only ten men in each truck and warned not to sit over the area of the rear wheels, life was becoming interesting. After crossing the desert we started to move into the mountains, no roads just dried up riverbeds called wadis. Armoured cars and helicopters escorted us with troop piquets on the mountain tops. On through Thumier to the Royal Marine's base at Habilain, our job was to work under RM command manning one of the piquet locations towards a place called Cap Badge. On arrival at our location the people we were relieving quickly moved out, at the same time shouting a warning to keep our heads down that night, as we would get a welcome for certain. We had also got the information that our location was some four hundred yards from the place the SAS were killed. We were due to test our weapons at 1800 hours, which was the time the area came under curfew. However one of my men known as 'The Nerve', kept saying he had seen men on the ridge above our position. He got us all so jumpy that we asked permission to try a few shots into the area to see if we could get a reaction, but the answer was no. So we settled down to wait for another 15 minutes. Suddenly the crack and thump of rifle fire rang out and the noise of machine guns. I assumed the guard post had not been told they could not fire and had commenced shooting. At that point angry little red things started flying past my head, tracer bullets, only going in the wrong direction towards the guard post and not from it. Also they were only the ones you could see and there were another three in between each of them. Our platoon grabbed our weapons and started to return fire into the area that 'The Nerve' had indicated, and sure enough we could see rifle flashes so we quickly put down a lot of fire to beat them off. Welcome to the Radfan. Our life for the next few weeks revolved around three activities, guard one night, ambush patrol the next and a night on standby. But it was not boring, and in fact we had plenty of excitement, even managing to shell ourselves one afternoon, whilst setting up a defensive fire zone with the Royal Artillery. Slowly we gathered more information from various patrol reports, which showed the dissidents only seemed to like operating on moonlight nights. Also, it appeared, they used some tracks not too far from our location. It was decided that we would send out an Ambush Patrol into this area, covering a certain track coming up out of the wadi, on the next good moon period. Our platoon commander, Lieutenant Smith, chose his strongest patrol possible, but also having to consider leaving a good defense on our own camp. I was given the job as second-in-command, leading the cover group. This was the group providing security for the killing group. We moved out just after 1900hrs in the dark and got into our ambush position before the moon rose at about 2002hrs. We were only about 600 yards from our own camp. The track came up from the wadi to our right and Lt. Smith covered this with his group, my group was to his left and slightly higher up the mountain, covering his left flank and rear. Within 2 hours we had the first indication that there was trade in the offering, when the dogs in a village about one and a half miles away and in the right direction started barking. Everybody's ears were now alert and the next sign was a donkey braying. This was stopped quickly by somebody, but the only problem was it came from the wrong direction, and it appeared to come from my front, which was from Lt. Smith's left side. After a short interval we heard some rocks being tumbled down a slope, a tin can getting disturbed and an Arab speaking voice giving the culprit a rollicking. All of this was from the same direction but getting nearer. At this point the killer group did the one thing you do not do in an ambush, they moved their location to the left, so that our two sections were overlapping with my group higher up than they were. Almost immediately we saw a group of armed men in some form of uniform moving directly towards us, no more than 200 yards away. It would appear they had not detected the move the killer group had made. They came on in a line directly behind one another and the question going through my mind was when were we going to hit them, if it stayed like this. We waited until it seemed they would walk into us, then at about 50 yards distance they turned to their right and walked across our front. I counted nine, five, a gap then four, and then our patrol opened up. They were well-trained and those still able dashed into the rocks at our feet. We were receiving rifle fire from somewhere to our front, but were concentrating on the rocks below to take too much notice. Suddenly the survivors from the first bursts of fire made a dash for it in various directions, and all hell broke loose with people taking the nearest target to them. Strangely both of our light machine guns picked on the same guy running to the right trying to get down the wadi, and the tracer bullets were crossing just an inch or so in front of him, but seemed to keep at that distance as he ran. Would they never get him? Suddenly he appeared to blow up, there was an almighty flash and bang in front of him and down he went. At this moment I got the message that my number 2 on the machinegun, Pte. Terry Sullivan, another TA soldier, had been hit and thrown about ten feet away. I crawled to him and he was rolled up in a ball holding his arm to his chest, I asked where he was hit and he replied the arm. Having checked as best as I could there was no major bleeding, I got down to Lt. Smith to report and to get morphine for Terry. As soon as this was administered I was ordered to take the patrol back to our FRV (Final Rendezvous Point) and wait for Lt. Smith and the radio operator. As we waited Lt. Smith directed the Defensive Fire Mission down onto the location and got out fast to join up with us, and we returned to base to await the dawn. Sullivan had his wounds dressed and awaited casevac the next morning, and his main moan was that he had lost his new tattoo, which he had only had a couple of months. At first light we were back at the ambush site and at first were disappointed to spot only 2 bodies, (a further six were found in the days following, hidden under rocks or in crevices). Having checked they were not booby trapped we carried out a recce of the area. Blood trails went in several directions and we found that one of the bodies had no weapon, and this had been spirited away during the night. In fact, from the empty cartridge cases under him we knew it was a Bren gun. Our area was quiet for the rest of our stay, as well as for the unit who followed us in. We were no more than 200 yards from the scene of the SAS beheadings and would like to think we had avenged them. We moved back to the Yemen border on another occasion at a place called Mukerous (NOT SURE OF SPELLING). 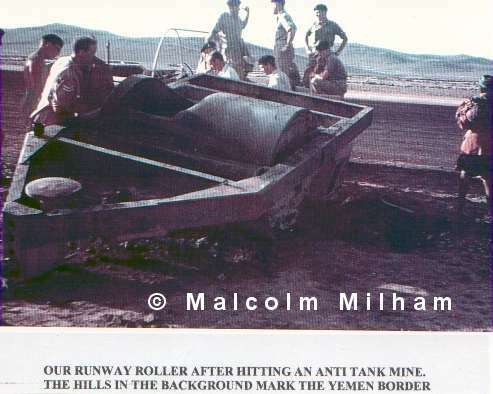 Although we had several incidents, including our airfield roller hitting a mine, being shelled from across the border, and one of our patrols getting ambushed, (no casualties) nothing measured up to our time at 'Piccadilly' in the Radfan. Our battalion finished it's time in Aden by late October and those of us in the TA returned to 'civvy' life. Whilst I was in Aden my old ship HMS Victorious came in and I was able to go onboard and met up with a guy who I served with whilst in the Navy. I must say that Remembrance Sunday early in November took on a new meaning from then on. Early in 1966 I was buying my newspaper on the way to work, when I glanced at another paper on a different pile, and there was Lt. Smith with the announcement that he had been awarded the Military Cross. This guy was a smashing officer and got many a rollicking for us calling him ' Jock', as Scotland was his land of birth.